Intro from Jay Allison: Joe Richman and his team have just published the "Radio Diaries: DIY Handbook" --a really useful compendium of techniques for diarists and producers, based on a feature Joe wrote for Transom. I wrote the foreword which we include here, hoping you may be inspired to go get the book to read the actual content. It's an excellent manual for a delicate craft. I own a book about do-it-yourself fiberglass boat building. In it, I have discovered that in order to build your boat, you’re going to need lots of power tools; you should understand things like Colloidal Silica; fires can start; you have to wear masks and protective clothing to avoid chemical burns. I’m sure some people use that book to build boats themselves, but it seems really hard. Now, radio stories — those you can build. Sure, some people tell stories better than others, but pulling together the basic ingredients — the tech and the techniques — IT’S NOT THAT HARD. You can learn it, without much risk to yourself and others, I promise. And this book is an excellent place to start. As for tools, in the early days of public radio we used reel-to-reel tape and razor blades. That was fun, but it’s easier now, and cheaper. Digital technology has made everything more accessible — from recording gear, to editing and mixing software, to pathways to your audience. These days, you don’t even need to rely on others for access to people’s ears. You can go straight in, via podcast and web. You can do it all yourself — every element, from conception to completion. So, being a control freak can work for you. But, if you don’t have control issues, no problem. In fact, it probably means you have more friends, so just collaborate. If you’re a poet, work with your tech geek pal. If you’re a diary-keeper, find a producer. Presto, radio. Radio Diaries, like the name says, are intimate, first-person tellings of life as lived by the tellers. They appear to be unmediated. Of course, this isn’t quite true. All the pieces in the Radio Diaries series are collaborations between the diarist and an editor/producer. And this makes sense. An unfiltered diary can be a boring or dangerous document, but handled with care, it has real potency, because it forges a direct connection to listeners — offers them secrets, and allows them inside the lives of strangers. Most stories you hear on the radio are reported. Someone is telling you what happened, and guiding you through the events. This is actually a much easier way to build. Cutting out the narrator is like assembling a structure without nails, joining wood to wood. Elegant on the surface, but intricate underneath. When I began making radio stories in the 1970s, I sometimes offered my mic and recorder to the subjects suggesting they document themselves. I ended up making un-narrated pieces. I confess, though, that was partly out of cowardice. I was afraid to speak. It was also out of respect. I wanted to listen. Reported stories, no matter how great they are, insert the reporter’s sensibility and style into the narrative. When outside narrators tell the stories, you feel their contexts in their voices. Along with the story, you notice the podium from which it is told. Listen to any vintage reporter piece to hear what I mean. Un-narrated pieces, on the other hand, arise from their sources and become a kind of time capsule of human experience, capturing an undiluted essence, feeling real. There are lots of tricks to this. Perfect simplicity requires complex thinking. Joe Richman and the crew at Radio Diaries have been at this a long time. They are masters of the form. They’ve blazed a lot of trails for you to follow. It’s worth noting that this book, and the work of Radio Diaries, sprang from public radio. It was created in the context of a mission, a public service, a common goal of civic good. This is important. It keeps the work from being selfish, or from merely seeking financial gain or popularity. 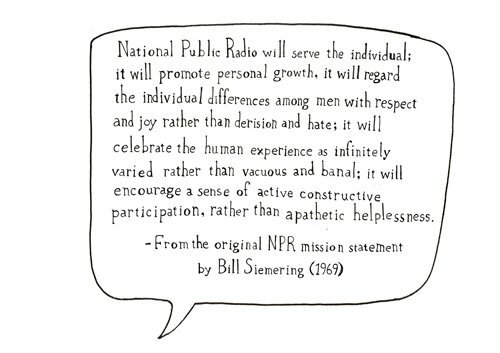 It creates a community of work so that, taken together, all the stories we make in public radio can affect the tone of civic life. Some of the hallmarks of that tone are care, curiosity, empathy, and a commitment to quality. There is also an inherent generosity, a willingness to share experience, with idealistic values at the core. And, there is generosity about passing on our skills. In a lot of professions, the old guard doesn’t want new talent nipping at their heels. That’s not true in public radio, or the audio storytelling world that has grown out of it. We want company. We want our enterprise to be alive and fresh and we want to hear new things. We want to hear from all corners of life — all colors, regions, classes, ages, beliefs. We want to know each other’s stories. We want to listen. In fact, we want to be wholly listening, not just engaged in the prevalent half-listening we all do. Distracted focus marks our digitally fractured days. I even shortchange my own kids with my listening, which feels inexcusable. When was the last time you gave whole-hearted, undivided attention to someone for a sustained period of time? It has always been a gift, but it is increasingly precious. In order to make good stories, you must offer that kind of commitment. If you’re a diarist, you have to fully communicate, no holding back. It’s terrifying, but you’ll be okay. If you are a producer, you need to let the voices enter you and inhabit you, like spirits. Give yourself to them. To craft the story, let it come to you, the flow of it. Imagine the way you’d most want to hear it told. Make it in your own head first. Use this book so others can hear it too. And finally, remember, radio is a kind of magic, because it doesn’t exist. It’s like air, it’s atmospheric — all around you and inside you. You can’t touch it. It becomes a part of you. That’s powerful stuff — better than fiberglass. This essay is the foreword to the Radio Diaries: DIY Handbook. 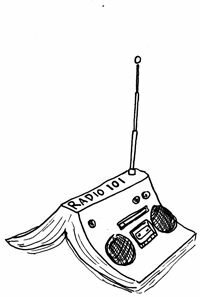 You can buy your own copy of the Radio Diaries: DIY Radio Handbook here. Or you can read it online here. Illustrations by Issac Kestenbaum and graphic design by Beth Cole. I LOVE buying non-fiction books as the knowledge and information is so amazingly accessible (they’re just sitting on the shelf!). Sadly, if I can’t listen to books then I rarely have the undistracted time alloted to sit down with a good book and make it anywhere close to “through” the book. Granted – 3 kids 5 years old and younger is a stage in life – but having Amazon + Audible upgrades is a miracle of 2017 technology. Holy holy, grail. So excited for this. Hi. I second the wish for a Kindle version, and I hope you’ll make your book available in Canada soon. This sounds amazing! I will add my name to the lists of those that would like to see a digital and Canadian version.